I’m sure most of you have seen this already. It’s pretty cleaver. Find all the answers you need to that burning question: What the FOCA?! at whatthefoca.com. I have heard from several people who are skeptical about the chances of such a bill even coming up for a vote in the next few years. But in this interview with Students for Life of IL, executive director of the Thomas Moore Society Peter Breen warns us to stay on guard because even if the entire bill itself doesn’t get through congress we could see attempts to pass bits of it through different legislatures – state and federal. 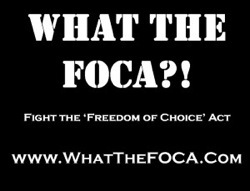 You may not recognize them as FOCA when they come up, but these will be attacks on the partial birth abortion ban, parental notification, conscience rights, etc…gradually chipping away at our current pro-life legislation one by one, state by state instead of in one federal bill altogether. New York’s pending Reproductive Health and Privacy Protection Act would be a good example. On their website you can get WTF t-shirts, sign the WTF petition and find out how to organize your own WTF day of action.